After announcing the pricing structure for the 2019 Toyota RAV4 a couple of months ago, Toyota Canada has just released the MSRPs of the compact SUV’s hybrid variants. Starting at $32,090 before freight and delivery charges, the RAV4 Hybrid LE features an Entune 3.0 infotainment system with seven-inch touchscreen, Apple CarPlay integration, dual-zone climate control, LED headlamps and daytime running lights, 17-inch alloy wheels, roof rails as well as the brand’s Toyota Safety Sense 2.0 package that includes forward precollision alert with autonomous emergency braking, adaptive cruise control, blind spot monitoring and more. The $35,090 RAV4 Hybrid XLE adds a power sunroof, an eight-way power driver’s seat, a power tailgate, an intelligent key, a heated and leather-wrapped steering wheel, rain-sensing wipers, fog lamps, five USB ports as well as chrome door handles and exhaust tips. The $38,390 RAV4 Hybrid XSE gets a sport-tuned suspension, 18-inch wheels, a black roof, an eight-inch touchscreen, SiriusXM compatibility as well as sport front seats with Softex upholstery, among other things. For an extra $2,500, a Technology Package can be add that rounds up a nine-speaker JBL sound system, embedded navigation, park sonar, intelligent parking assist and wireless phone charging. 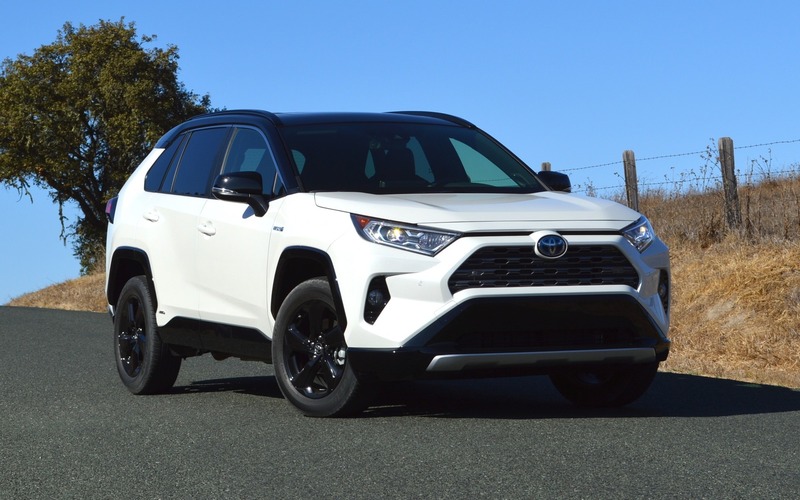 Finally, the $42,090 RAV4 Hybrid Limited receives all the features of the XSE with the Technology Package, except for the sport suspension and fog lamps. It also benefits from unique 18-inch alloy wheels and grille, chrome outside mirrors with puddle lamps, a hands-free tailgate, heated and ventilated front seats, heated rear seats and specific Softex leather upholstery. The price range for the non-hybrid RAV4 stretches from $27,990—or $30,690 with all-wheel drive—to $40,690. The 2019 Toyota RAV4 Hybrid’s powertrain combines a 2.5-litre four-cylinder engine, an electric motor and a battery pack to produce a total of 219 horsepower, managed by an electronically controlled continuously variable automatic transmission. All-wheel drive is standard. Toyota Canada announces city/highway fuel economy ratings of 5.8/6.3 L/100 km, for a combined average of 6.0 L/100 km. The previous-generation RAV4 Hybrid’s combined rating was pegged at 7.3 L/100 km. The RAV4 Hybrid goes on sale this spring.